How soon do you need your order? Futon Barrel Nut (Minimum Purchase 2) - These nuts are also called Cross Nuts, Dowel Nuts, or Cylinder Nuts. They are inserted into holes in the Main Support Boards, or Stretcher Boards on a Futon Frame. Bolts are then inserted through the Futon Frame Arms, which catch the threads of the Barrel Nuts to hold the Futon Frame together. Some nuts are a little longer, and some are a little shorter, but the hole usually lines up with either size, so these will work even if they are a little off in length. For Faster Shipping - To add any faster shipping method add 1 item to your cart, with the faster shipping method, and then add any other items to your cart with the standard free shipping method. You will only be charged for 1 Faster Shipping Charge, and all quantity discounts will apply. Warning: The threads of these Barrel nuts will fit our bolts but they may not fit your existing bolts. 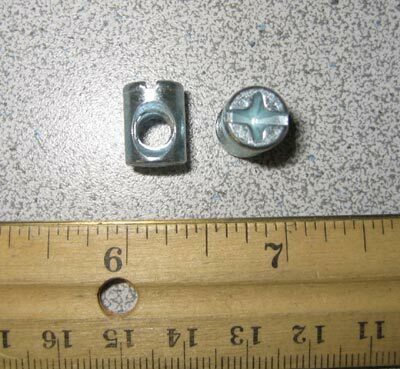 Measure the threads on your bolts and compare them to the size listed below. We recommend buying our bolts which come with our barrel nuts which we know will fit.